The call for a 48-hour-long nationwide shutdown evoked mixed response from most parts of India, with protests marred by violence in parts of West Bengal and North East India. The bandh was a result of a clarion call issued by a host of organisations, trade unions, independent workers, and other groups over a wide ranging bunch of issues. However, the common thread binding the nationwide shutdown was the resentment against the ruling dispensation in New Delhi. Most parts of India faced a shutdown due to the government workers, trade unions, and bankers associations protests against anti-labour policies and unilateral watering down of labourers' rights by the BJP-led NDA government. The northeastern part of the country was up in arms against the Centre's bid to pass and implement the Citizenship (Amendment) Bill 2018, which will grant Indian citizenship to non-Muslim migrants from Bangladesh, Pakistan and Afghanistan. Looking at the overall picture, the bandh was near total in North East India with the All Assam Students' Union (AASU) calling for a shutdown after a gap of 10 years, which is also being supported by the erstwhile BJP ally Asom Gana Parishad (AGP), the Opposition Congress, the AIUDF, and the Krishak Mukti Sangram Samiti (KMSS). In the rest of India, the strike evoked mixed response as banking services and state transport took the maximum brunt of the shutdown. However, many private establishments remained open in defiance to the shutdown call. 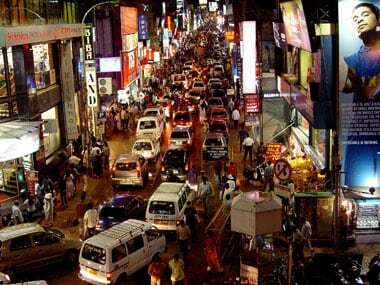 Only in Kerala was the effect almost absolute with only a few traders' associations keeping their establishments open in defiance. However, they too were later forced to down shutters. West Bengal, meanwhile, saw major clashes between the ruling TMC and Opposition CPM workers as the latter tried to enforce the shutdown while the former were seen thwarting them. 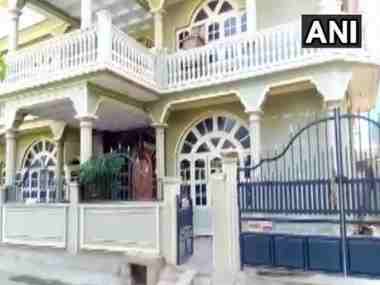 At one place in Murshidabad, nine TMC workers were injured after a bunch of CPM workers attacked their party office. The government, meanwhile, brought in bills upsetting both segments of protesters on the same day as they were out on streets to seek their rights: Coincidentally or otherwise, the Centre decided to table both Citizenship (Amendment) Bill and the amendment to Trade Union Act 1956 in Lok Sabha on Tuesday. Why is North East India protesting? 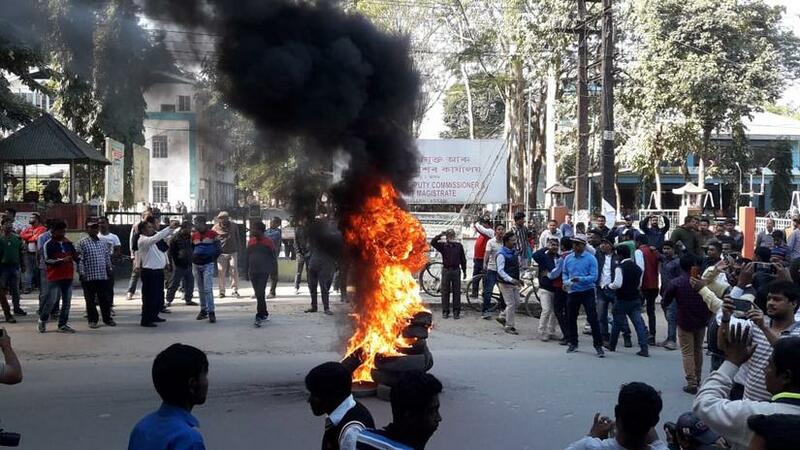 The 11-hour North East bandh, called by a number of students' organisation and political parties on Tuesday, was to protest against the controversial Citizenship (Amendment) Bill 2018 which was tabled in the Parliament as the protests raged on. The political aim behind the bill seems to target the majority Hindu population in the Lok Sabha elections, but it faces widespread opposition from the northeastern states, primarily because the fault line dividing demography in these states is linguistic and cultural, rather than religious. Thus, the Assamese-speaking people, or the Gorkhas in neighbouring northeastern states, are less than enthusiastic hosts to the large number of Bengalis who have crossed over to India, regardless of whether they are from West Bengal or East Bengal/East Pakistan/Bangladesh, or whether they are Muslims or Hindus. In Assam, tyres were burnt on roads at various places to block roads, vehicles were damaged in Guwahati, Tinsukia and Dibrugarh districts, while rail traffic was affected briefly due to the various blockades planned across state. Shops, markets, financial institutions kept their shutters down. Educational institutions, private offices remained closed and private vehicles, including long-distance buses, kept off roads in the Brahmaputra valley, police and official sources said. Attendance in government offices was thin as the employees had difficulty in reaching their workplace in the absence of adequate public transport, the sources said. A skeleton service of the government-run Assam State Transport Corporation buses was pressed into service. Several students' bodies of the region have decided to observe the 'bandh' in support of the call given by the North East Students' Organisation (NESO), an umbrella organisation of students' unions, of which the AASU is a constituent. Thirty ethnic organisations are also supporting the bandh in Assam. Protesters vandalised the Bharatiya Janata Party's office in Dibrugarh, which is the home district of Assam chief minister Sarbananda Sonowal. Protesters raising slogans against the Citizenship (Amendment) Bill vandalised the BJP office situated at Amolapatty just 100 metres from Amolapatty police outpost. However, the police managed to disperse the protesters and take the situation under control. 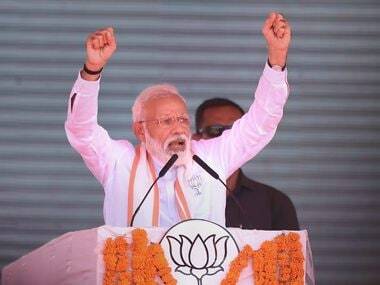 The bandh evoked response in the Bengali-majority Barak valley also where Prime Minister Narendra Modi on 4 January had announced that the Citizenship Amendment Bill, 2016 will be passed as soon as possible in the Parliament as a penance for past injustices. The bill seeks to amend the Citizenship Act 1955 to grant Indian citizenship to people from minority communities — Hindus, Sikhs, Buddhists, Jains, Parsis and Christians — from Afghanistan, Bangladesh and Pakistan after six years of residence in India instead of 12 even if they do not possess any proper document. The AGP and other groups in Assam have said the provisions of the bill will nullify the 1985 Assam Accord, which provides for deportation of all illegal migrants, irrespective of religion, who had entered the state after March 1971. Meanwhile, member organisations of the NESO in other states such as Mizo Zirlai Pawal (MZP), All Arunachal Pradesh Students' Union (AAPSU), Khasi Students Union (KSU), Garo Students Union (GSU), Naga Students' Federation (NSF), All Manipur Students Union (AMSU) and Twipra Students Federation (TSF) are also supporting the bandh. Why are trade unions, workers protesting? A host of Central Trade Unions, independent groups, transportation workers, contractual workers and employees of the government on Tuesday began a two-day nationwide strike to protest against the government's alleged anti-worker policies and unilateral labour reforms. "The strike is quite visible in Assam, Meghalaya, Karnataka, Manipur Bihar, Rajasthan, Goa, Punjab, Jharkhand, Chhattisgarh and Haryana — particularly in the targeted industrial areas and different mines," Amarjeet Kaur, general secretary of All India Trade Union Congress (AITUC), told PTI. As many as 10 Central Trade Unions (CTUs) have joined hands to go on a two-day nationwide strike from Tuesday. 20 crore workers are expected to join the strike. 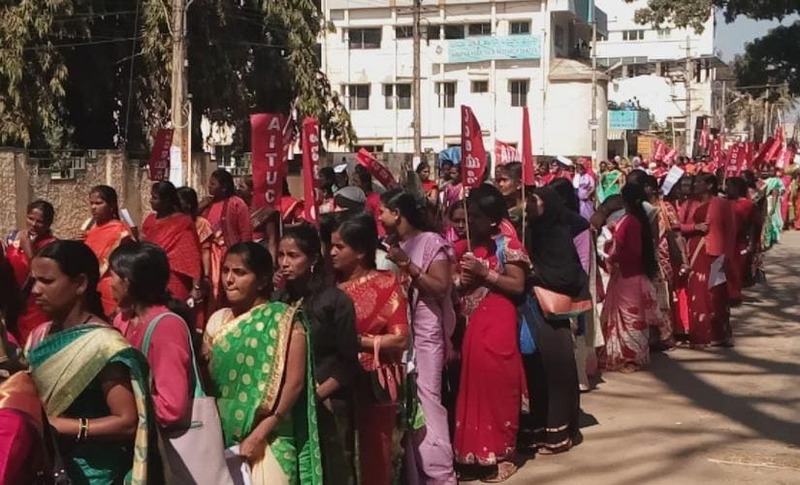 This is the largest number of workers from formal and informal sectors joining a strike against anti-people and anti-worker policies of the BJP-led central government, she stated. She said that some states' transport departments, taxi drivers and autorickshaw drivers have gone on strike for two days while railway workers are holding a gate meeting bearing black badge to express their solidarity. The CTUs are also opposed to unilateral labour reforms, are demanding social security for all workers, end of contractual employment and extension of equal benefits to contractual and temporary employees under the principle of equal work and equal pay. In a joint statement, the CTUs had also alleged that the government undermined tripartism and continued its "aggressive attack with arrogance on the lives and livelihood of the working people." The unions are also opposed to the proposed amendments in Trade Union Act, 1926, saying those are irrational and extremely damaging to the independent functioning of unions. The bill proposes to grant statutory recognition to trade unions at both the central and state-level. However, unions have pointed out that the bill seeks to vest the government with the discretionary power in recognising the trade unions, departing entirely from the existing practice based on tripartite (employees, employers and government) consensus. 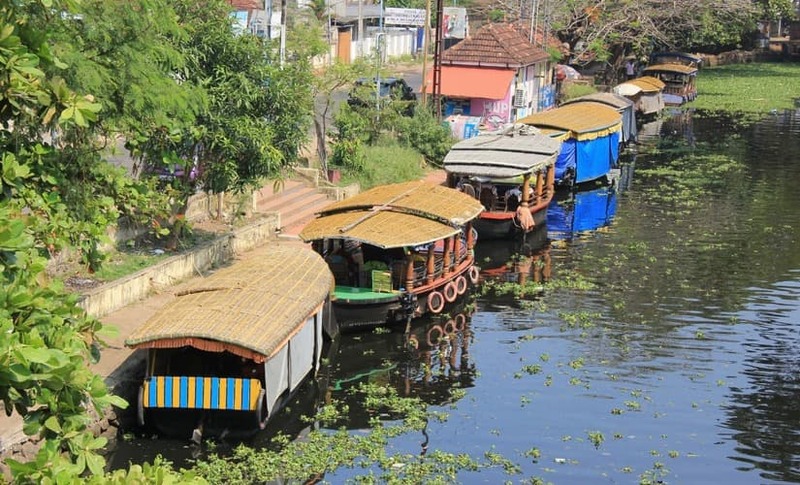 In Kerala, trains were stopped, buses and autorickshaws kept off roads and traders were forced to down shutters on the first day of shutdown. Sabarimala pilgrims, although exempt from shutdown, also faced the brunt of the bandh. Pilgrims mostly from other states were stranded at railway stations and bus stands in Thiruvananthapuram, Kollam, Patghanamthitta, Ernakulam and Palakkad districts as supporters of the strike blocked trains and private bus operators and state-run Kerala State Road Transport Corporation were also forced to remain off roads in face of massive protests. The effect of the shutdown was such that it brought the functioning of the government offices in Kerala, including state secretariat at Thiruvananthapuram, also to a standstill. While most employees did not report for work, a few who came were prevented from entering the offices. Even Chief Minister Pinarayi Vijayan, his cabinet colleagues and senior officers kept off the secretariat. The Left unions also blocked traffic on a road leading to the secretariat by erecting a shed for their meeting. The assurances given by trade union leaders not to enforce the strike in Kerala also remained futile with trade union workers preventing workers from going to offices, blocking vehicles and trains and forcing traders to close shops and business establishments throughout the state. The assurance was given by the leaders following strong public opinion against frequent shutdown strikes (hartal). The general strike turned out to be a hartal with vehicles keeping off the roads, schools and colleges declaring holidays and shops and business establishments remaining closed in most parts of the state. The trade union workers clashed with traders in Malapuram and Alapuzha districts when they tried to open the shops. The strike also hit the functioning of the industry. In West Bengal, the mood of the protests edged near violence as AITMC workers were seen preventing Left-wing trade unions from enforcing the shutdown. 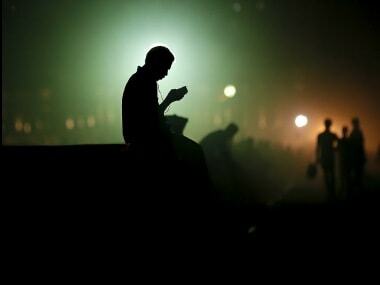 Clashes between the two groups were reported at several places including Asansol, Hooghly, Murshidabad, and Kolkata. 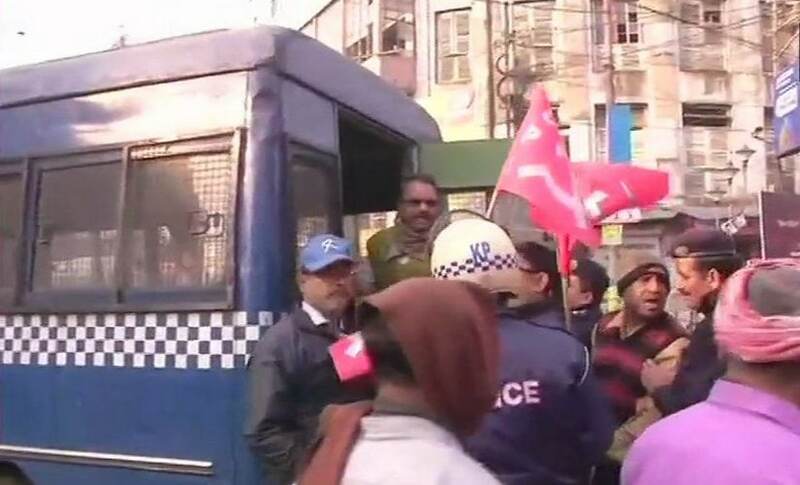 Eight CPM workers, including party leader Sujan Chakraborty were briefly detained, while nine persons of the Trinamool were injured after a bunch of CPM workers attacked their party office in Murshidabad. The TMC alleged that the Left party workers attacked its cadres with iron rods and bricks, heavy amount of stone-pelting was also reported. The protesters also targeted a school bus in Barasat city of North 24 Parganas district, prompting state's child protection committee to send a notice to the CPM leadership. Another bus was vandalised in Barasat, making the town the worst-hit in state after the initial few hours of bandh. In Karnataka, schools and colleges were shut and workers took out marches to mark their protest. However, normal life remained by and large peaceful. In Odisha, traffic on National Highway 16 was briefly disrupted as protesters blocked the roads. Seven trains from Bhubaneswar have been cancelled due to the ongoing protests. 22819/22820 Bhubaneswar-Visakhapatnam Inter City Express, 58416/58415 Puri-Cuttack Passenger, 58436/58435 Cuttack-Brahmapur Passenger, 58424/58423 Cuttack-Bhadrak Passenger, 68434/68433 Brahmapur-Cuttack MEMU, 68435/68436 Cuttack-Paradeep MEMU and 58411/58412 Bhubaneswar-Brahmapur Passenger were cancelled from both the directions. In Maharashtra, anganwadi workers, trade unions and contractual workers held a sit-in protest at Azad Maidan in Mumbai. Around 29,000 employees of the civic-run transport service BEST are on an indefinite strike for various demands despite an industrial court restraining them from taking the step. Due to the strike, around 25 lakh passengers who travel by 3,000 BEST buses that ply on streets of Mumbai city and the metropolitan region every day were inconvenienced even as the MSRTC plied additional buses to help the commuters. Meanwhile, sources said the Maharashtra government might slap Essential Services Maintenance Act (ESMA) on the striking employees. The Act gives police the right to arrest, without a warrant, anybody violating the provisions. The BEST management had declared the strike illegal and issued internal circulars warning staffers of strict action if they proceeded with it. When all talks between the parties failed, the BEST management approached the Industrial Court seeking relief against the strike.